Smartphones are now the gateway to your banking transactions, paving the way for more mobile apps and digital payment solutions to ease your lifestyle by reducing branch visits. This has indeed kept pressure high on the UAE banking sector to innovate and turn customer satisfaction to customer delight. Blockchain technology, Emirates Digital Wallet, cyber security, mobile apps, fintech solutions, data analytics, artificial intelligence and robotics are some of the key initiatives being embraced by banks to welcome the digital era. The UAE banking industry, which has proved resilient in the past two years, has come up with digital solutions to stay afloat in market competition, building stronger foundations to welcome 2018 with a positive outlook. "The UAE banking sector faced a trying time through the economic slowdown. Slower loan growth implies more pressure to perform, mainly with the increase of the Fed rate. 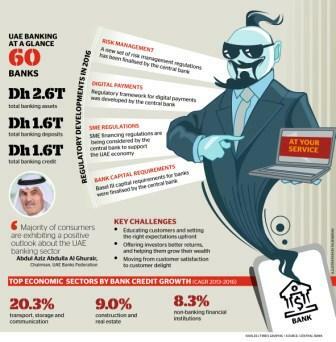 In spite of these challenges, according to the UBF Trust Index, consumer perception of the UAE banking sector remained robust with majority of consumers exhibiting a positive outlook about the UAE banking sector," said Abdul Aziz Abdulla Al Ghurair, chairman, UAE Banks Federation (UBF), a body represented by 49 member banks. With around 92 per cent Internet penetration and having a large user base of smartphones, the UAE banking industry is a hotbed for innovation and digital transformation. An important way of staying ahead of the curve will be by integrating innovative digital solutions, according to the UBF's latest report. In a recent survey by UBF - with a sample size of 1,530 - it is evident that among 85 per cent are aware of mWallet and 72 per cent had positive impression in 2016. Almost 73 per cent are confident in banks' contribution to UAE economic development. However the key challenges are educating customers and setting the right expectations up front; offering investors better returns, and helping them grow their wealth and moving from customer satisfaction to customer delight with world-class customer service. So how do you now move from delivering merely satisfaction to delight, explains, Suvo Sarkar, senior executive vice-president & group head - retail banking and wealth management, Emirates NBD. "With high levels of internet penetration, smart phone usage and a growing millennial population, UAE's banking customers increasingly expect their bank to be 'on' 24 x 7 and accessible to them at the tip of their fingers." Emirates NBD has been leading the digital banking evolution in the region since the turn of the decade. The bank is also carrying out a planned investment of Dh1 billion over the next three years to carry out a digital transformation programme. Sarkar does acknowledge that while the UAE retail banking market has seen varying levels of stress on market liquidity, SME business and on retail credit over the last two years, the sector has proved to be resilient with banks continuing to invest and grow their franchises. "With liquidity pressures easing, improvement in loan provisions, rising interest rates and a favourable macro-economic outlook, the UAE retail banking is poised to have a good year ahead. Additionally, the build up to the Expo 2020 has begun which will provide a further fillip to the economy in the coming years through increased activity and influx of working professionals and as the Official Banking Partner, Emirates NBD will play a key role in this national initiative," he said. With around 92 per cent internet penetration and having a large user base of smart phones, banks are a hotbed for innovation and disruption, the UAE is moving rapidly in this space with a number of initiatives. "Blockcahin technology, Emirates Digital Wallet, Cyber security, mobile apps, fintech solutions, data analytics, artificial intelligence (robotics) etc are some of the key initiatives that are being embraced by banks. The Central Bank of the UAE has been very proactive in issuing guidelines and regulations for banks. All these initiatives are bound to improve efficiencies of the overall banking sector," informs Krishnan Ramachandran, CEO, Barjeel Geojit. "The overall prospects for the UAE Banking Sector looks quite promising for 2018. There is visible change in the overall performance indicators of the banks viz. Operating revenues, improved cost income ratios and profitability of UAE leading banks," he said. He said the investment impetus for 2020 has begun, this will take more concrete shape in 2018 which will have a positive impact on the banking sector. Added to this is the overall improvement in the global economic growth will also have a tangible impact in the UAE. The non-oil private sector growth has been steadily improving over the last few months (Emirates NBD PMI Index) signaling an improvement to the economic headwinds for the UAE. The UBF survey also points out that surge in non-banking market participants is also creating healthy competition for banks. Ramachandran said some of the non-banking participants that compete among others include exchange houses, finance companies, investment banks, private banking companies etc while there are good competencies within the banks in the retail and corporate financing side of the business. "They face tough competition from exchange houses (remittances) and private banks (wealth management solutions), however this gap is being addressed by some banks and are scaling up their capability in this sphere as well." In terms of asset size, Al Masah Capital founder Shailesh Dash said the UAE remains the largest banking industry in the region with assets of $710.8 billion as of 2016, up from $453.4 billion in 2011, reflecting a CAGR of 9.4 per cent for the period. "As a result, the UAE's market share as a percentage of GCC's total assets increased from 31.4 per cent in 2011 to 33.6 per cent in 2016. The financial soundness of the UAE's banking sector is largely due to the effectiveness of the regulatory framework implemented by the Central Bank of the UAE." He said the central bank also recognises that the development of FinTech that will play an important role in shaping the future of the financial services industry in the UAE, and in this regard, it is in the process of finalising two new regulations in this area, specifically dealing with digital payments and crowd funding. The UAE banks will need to optimise their business processes at the same time that they meet these regulatory requirements. They are also under immense pressure to compete, particularly with the entrance of non-banking market participants. "An important way of staying ahead of the curve will be by integrating innovative digital solutions," the UBF report said.